'All About Presentations' by Jazz Factory: Which colour jersey does your font wear? Which colour jersey does your font wear? The Football world cup just ended. Being from Bengal, a soccer crazy state in India, I have always been fond of Football. Its part of the culture and comes automatically. But this post is not about my passion for the game. While watching one of the matches I was wondering about the Jersey colours of the teams. The jersey colours, as you are aware, are chosen so that players and viewers can easily differentiate between the two sides. Hence Spain is blue and the Netherlands Orange. Image if Spain was Red & the Netherlands Orange, would you be able to figure out easily which team had the ball? If we use the same logic when we choose font and background colour, it would be great. By background colour I mean the colour against which the font will be read. It is not necessarily the slide background colour. The next time you have to choose the font colour, ask yourself this question: "If the background and font were two countries playing football, will I be able to differentiate the font against this background colour from the back of the room where I am presenting? Are these teams wearing the right colour jerseys?" I am sort of rigid when it comes to choosing font colours. My font colours are either black or white. I never choose any other colour. But I do play around a bit with background colours. 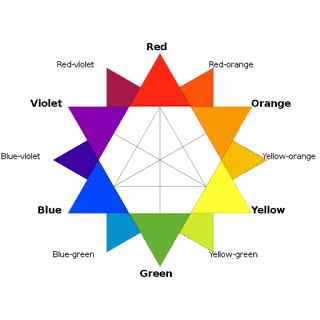 If you want to know which colours go together and which do not, you should consult the Colour Wheel (source) or a Colour Star (source). The colours opposite to each other are called complimentary colours and provide the best contrast. These are the colours one should ideally choose for font and background colours for best visibility by the audience. Colours which are together are called Analogous. Eg. Red, Orange & Yellow. They cannot be used as font and background colours. Prefer dark colours for fonts and light colours for backgrounds. This will give you better contrast and hence better readability. The ultimate objective for us is to make the slide look good without making it hard for the audience to read it. I make my fonts wear black or white jerseys. Which colour jersey does your font wear?